More than half (54 percent) of Americans recently surveyed by Transamerica reported that they believe they are building a large enough retirement nest egg, and 62 percent said that they are at least “somewhat confident” they will be able to achieve a comfortable lifestyle in old age. Both of those figures reflect significant improvements from the “Great Recession,” but many Americans still have concerns about how financially well-off they will be in retirement. Forty-eight percent of surveyed workers, for instance, said that they are worried their Social Security benefits will be reduced or cease to exist at some point in the future, and 44 percent reported concerns about potential health declines that will require long-term care. The biggest fear for respondents, though, is outliving their savings and investments (52 percent). That is not too surprising since surveyed workers anticipate living to a median age of 90, and nearly one in seven respondents expect to become centenarians. Even the more conservative estimates for life expectancy would still imply decades of retirement that need to be funded. 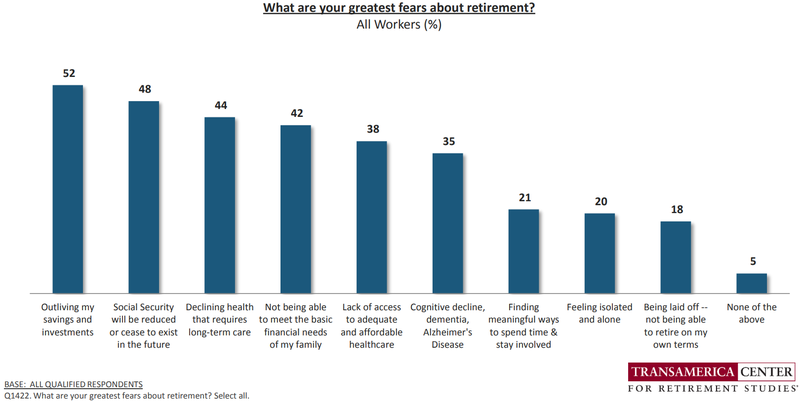 Understandably, workers estimate they will need to have saved around $500,000 (median) prior to retirement in order to achieve old-age financial security, although more than one in three respondents believe that they will need at least $1 million for similar well-being. Fortunately, many Americans are taking the right steps to help ensure a comfortable lifestyle in retirement. For example, most surveyed workers began saving for retirement by their 30th birthday, and more than three-quarters of respondents with access to an employer-sponsored savings plan said that they are participating. The latter can be especially beneficial because 401(k)s and similar plans generally provide participants with numerous tax advantages, and many employers will often augment a worker’s rate of saving through matching contributions. Moreover, 88 percent of survey respondents described their employer-sponsored retirement plan as being “very” or “somewhat” important, and 81 percent said that the savings programs offered by prospective employers play a significant role in their job search decision. A majority of worker respondents even said that they would be willing to switch employers for a nearly identical job with a similar company that offered access to a better retirement plan.